Shortest Triple in CPBL History? The Chinatrust Brothers’ 張志豪 (Chang Chih-Hao) is no stranger at hitting a triple. After all, he is the CPBL record holder for the most triples (62). But what happened on the night of April 13, it might be a first in his professional career. With the help of the stadium lights, Chang turned a potential “Texas League Single” into a triple. It was at the top of the fifth, and Chang Chih-Hao popped one up high in the air just slightly behind the second baseman. At first glance, it seemed like a routine flyout, but no, this is the CPBL we are talking about here. There is no such thing as a routine out. The Uni-Lions’ second baseman lost the ball in the lights, and the ball landed in the no man’s land between four Uni-Lions’ fielders. 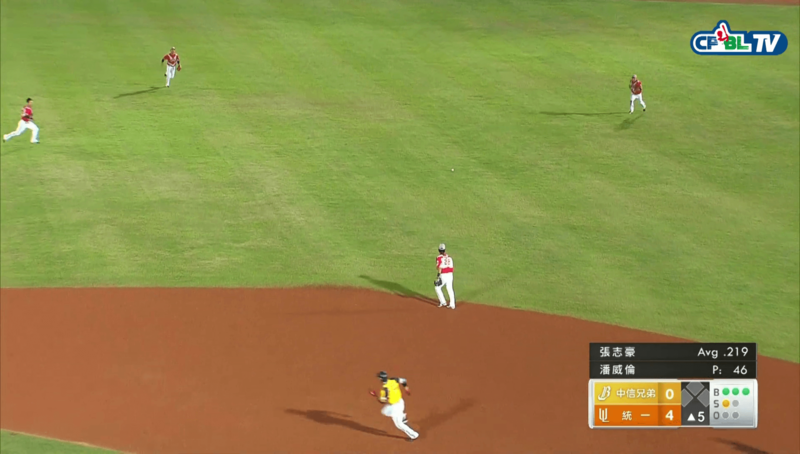 By the time the right fielder picked up the ball, the speedy Chang Chih-Hao has already crossed second and was able to reach safely to the third base. From the same game, Chang Chih-Hao also launched a solo shot in the top of the eighth. By doing so, he became the 19th CPBL player to reached the 100 career home runs milestone. That’s a pretty good clip. It’s clear to me that the right fielder blew it on this play. He should have run in right away to back up the second baseman in case what actually happened happened. He cost the team an extra base. The play makes me think about bunt doubles against the exaggerated shifts used in MLB nowadays. I don’t think anyone has gotten a triple on a bunt yet, but with a little luck it could happen if a hard bunt can make its way down into a bullpen past third base.